ATV Parts, ATV Radiator Kits, ATV Wheels Tires, ATV Suspension Springs Shocks Bumpers - Wild Boar ATV Parts > Radiator Relocation Kit > Kawasaki Brute Force (2012-2019) Radiator Relocation Kit w/ Screen (Silver) $189.00 FREE SHIPPING! « Kawasaki Brute Force (2005-2011) Radiator Relocation Kit w/ Screen (Silver) $189.00 FREE SHIPPING! Kawasaki Brute Force (2012-2019) Radiator Relocation Kit w/ Screen (Silver) $189.00 FREE SHIPPING! Now on SALE $189.00 FREE SHIPPING! 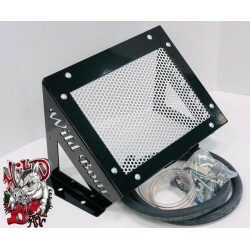 Here at Wild Boar we are happy to offer some of the best radiator relocation kits on the market. Keep your machine cool while riding in style our relocation kit for the Brute Force.These new screen kits are all Steel construction, complete kits that include all the necessary mounting hardware you will need. Laser cut and powder coated, this will not only be the most solid, but the best looking kit you’ll see around.